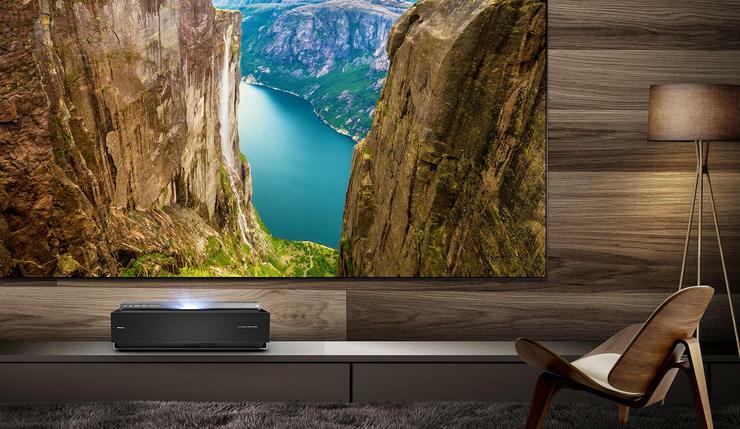 Ahead of this year's CES, Hisense have announced they'll be bringing their Series L 100-inch 4K Ultra HD Smart Dual Colour Laser TV with HDR to the Australian market later this year. “This unapologetically big and bold TV is yet another example of our commitment to bringing Australian consumers more choice at the premium end of the market. Globally, Hisense has invested heavily in the research and development of its proprietary laser technology, and the result is a truly innovative and exceptional TV, that provides an unparalleled at-home cinema experience,” said Andre Iannuzzi, Head of Marketing at Hisense Australia. Released overseas in 2018, the Series L is a Ultra Short Throw Dual Colour Laser "TV" that utilises Hisense's proprietary X-Fusion Laser Light Engine to project a 100-inch screen with over 8 million pixels and 3000 lumens of brightness. The Series L also comes with 14 built-in speakers plus a wireless subwoofer, powered by JBL Cinema Sound. Details are a little vague about exactly what operating system that'll power the thing, but Hisense do say that the Series L comes with "a built-in TV tuner while providing fast, simple and customisable access to hundreds of applications such as Netflix, Stan and YouTube built-in." Hisense say that full pricing and availability for the Series L 100-inch 4K Ultra HD Smart Dual Colour Laser TV with HDR will arrive later in the first half of 2019.